Kirkgate Park is location on the shore of Loch Leven next to the historic 17th Century landscape of Kinross House, and within the Loch Leven National Nature Reserve (LLNNR) . The park of almost 7 hectares is the main area of public Green Space in Kinross and is popular with both locals and tourists. There is extensive car parking off the access road that runs along the northern boundary of the park. A comprehensive park improvement project was completed in 2007. This resulted in an exciting children's play area, new site furniture and public toilets, and an extensive path network, enabling people to enjoy the Park via a variety of new routes. The shoreline path forms part of the Loch Leven Heritage Trail - a round the Loch multi-user path with interpretative features. 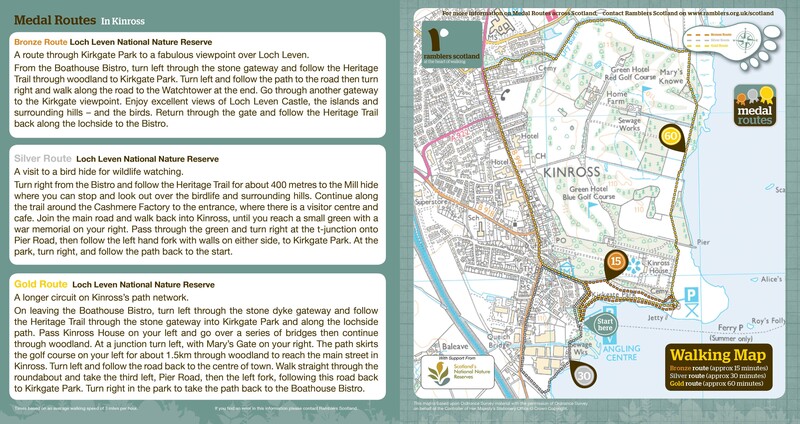 Details of further paths around Kirkgate Park, including Ramblers Scotland Medal Routes, can be found on our walks pages. New features such as the grass amphitheatre and wildflower labyrinth have added to appeal of the park for all ages. To contribute to biodiversity, shoreline grass areas, which were formerly close mown, are now being managed as wildflower meadows. Toilets - There is an automated toilet on site which is available all year from 9am - 7pm (24hour access with a RADAR key, for more information, visit the RADAR website). 20p entrance fee. The park, which and is part of the estate of Kinross House, was offered 'for the benefit of the townspeople' in 1913. It is located on land that has been occupied for many centuries, evidenced from the remains of an Iron Age crannog submerged in the loch close to the jetty. Ground to the north east of the park was the site of the original 12th century settlement before the movement of townsfolk to a new site further to the west was encouraged in the 17th century. If you would like further details about Kirkgate Park please contact Community Greenspace on 01738 475000 or e-mail communitygreenspace@pkc.gov.uk.